and freedom of choice begins today, through the next generation of the labor market. BitJob is the first freelancing platform that will be a hybrid of two Architectural paradigms. Centralized client server architecture, which is used in the majority of online applications. Decentralized version of client server architecture that uses blockchain technology. Using a hybrid platform is expected to educate students worldwide to understand the benefits of blockchain technology. With a market hybrid system will be semi-decentralized, thus expected to attract students into the blockchain ecosystem. The Peer to peer Platform Bitjob.io will revolutionize the way students earn money and gain experience that fits their interests and fields while still learning and continuing school. bitjob platform is prioritized for part-time jobs, giving students the opportunity to earn money and experience. For entrepreneurs Bitjob platforms can provide tremendous benefits and simplicity in finding literate freelancers who have skills to suit their needs. We are building the first decentralized platform for Short-Term Online Jobs, Powered by a Cryptographic token economy. bitJob Student Coin: STU will be purchased or sold with real money. 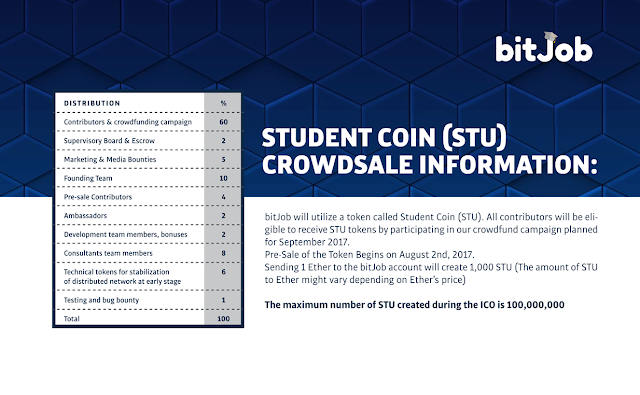 All our contributors will be eligible to receive bitJob STU Tokens, by participating in our Crowdfund Campaign Planned for September 2017. 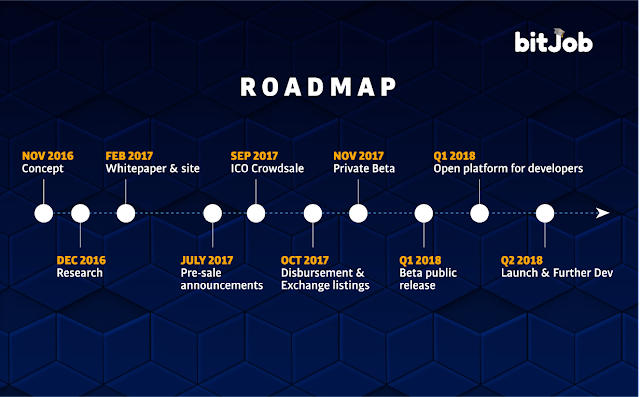 Don’t miss a chance to support a revolutionary project!. Presale begins August 2, 2017.